Lyme disease, believe it or not, is fairly common in the hunting community. It is often mistaken for other sicknesses making it drastically under-reported. Caused by the bite of an infected deer tick, Lyme disease symptoms can be severe and long-lasting. Some of it's symptoms are fatigue, stiffness, headaches, nausea, diarrhea, numbness, chest pain, abnormal heart rate or swollen and painful joints or glands. These symptoms can be mistaken for flu, arthritis, or stress and can occur a few days after being bitten. The symptoms usually disappear after a short time, unless left untreated. In which case they will return and get progressively worse. leading to migraines, heart arrhythmia, myocarditis (inflammation of the heart muscles) or severe arthritis. Although rarely fatal, the persistent symptoms tend to wear down the body's immune system, causing other health problems. Continued symptoms may lead to heart related and neurological problems. 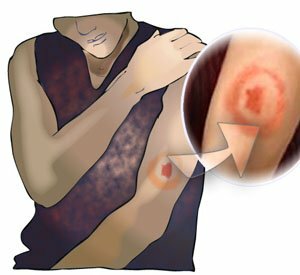 The bullseye-shaped rash around the site of the bite is one of the common signs pointing to Lyme disease (nearly 50-80% of the time). Most of the symptoms can be treated with antibiotics. Also, a new vaccine has come on the market, offering full immunity from the symptoms. The vaccine, LYMErix, was introduced for anyone between the ages of 15 and 70 and administered in three shot cycles in order to be fully effective. LYMErix, is highly effective for those with chronic symptoms, is noteworthy mainly because it kills the disease in the tick rather than in the human bloodstream. While the vaccine is highly effective in preventing Lyme disease symptoms,it is no longer available in the U.S. because of extreme side effects. So, hunters still need to protect themselves by avoiding tick-infested areas, wearing protective clothing, tucking in pants and shirts, and regularly checking for ticks. If you do get bitten by a tick, carefully remove the tick with tweezers, pulling it out as close to the skin as possible.